Attractions — Splash Kingdom Waterpark: The Beach within Reach! Splash Kingdom Waterpark in Redlands, California is home to one of the most-unique water attraction collections in the country -- with standouts including the world's tallest freestanding waterslide tower and one of the original FlowRider® attractions. Slip and slide into fun with these signature attractions! The Tower of Kings is the thrill-seeker's ultimate oasis. The tallest free-standing waterslide tower in the country, this structure houses eight unique waterslides -- from family raft rides to gripping body flumes. Looking for a challenge? Ride all 8! Running 745 feet in length and winding up the finish of the run with an electrifying 31-foot drop, The Wrath of Ra remains a fan favorite! Minimum Rider Height: 42"
A dark atmosphere paired with speedy turns and drops make Tut's Tomb one of our fan-favorites! Minimum Rider Height: 48"
Extreme banks + 360-degree turn = a refreshing ride on The Sphinx Express! Minimum Rider Height: 48"
The world's tallest fully-enclosed body slide, The Anileator™, stands 90 feet tall and offers a high-thrilling experience like no other! Minimum Rider Height: 48"
Pharaoh's Falls will send you free-falling down 70 feet of refreshing water. Minimum Rider Height: 48"
Standing 70 feet high, Pharaoh's Revenge offers a ride filled with twists, turns, and *of course* plenty of splashes! Minimum Rider Height: 42"
The pitch-black atmosphere of The Dark Chamber allows for plenty of unexpected drops, turns, and splashes -- including a splashdown in three feet of water! Minimum Rider Height: 48"
Ramses' Rocket sends riders down 400 feet of refreshing water in less than 12 seconds -- thrill-lovers rejoice! Minimum Rider Height: 48"
Launching from the current of the RipTide surf pool, The Flusher sends riders splashin' straight into The Nile River. This attraction requires a rental tube. Minimum Rider Height: 48"
Gather the entire family for some quality fun under the sun! 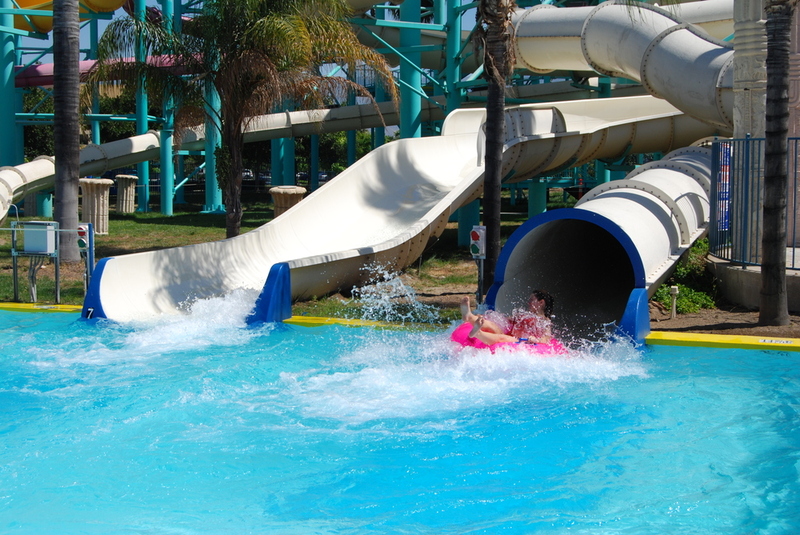 Simulating 17,000 square feet of ocean-like waves, Castaway Cove brings the beach to the Inland Empire! Relax with the entire family without the hassle of parking, sand, or sharks! Lifejackets required for those under 48". Parental accompaniment required for those under 42". 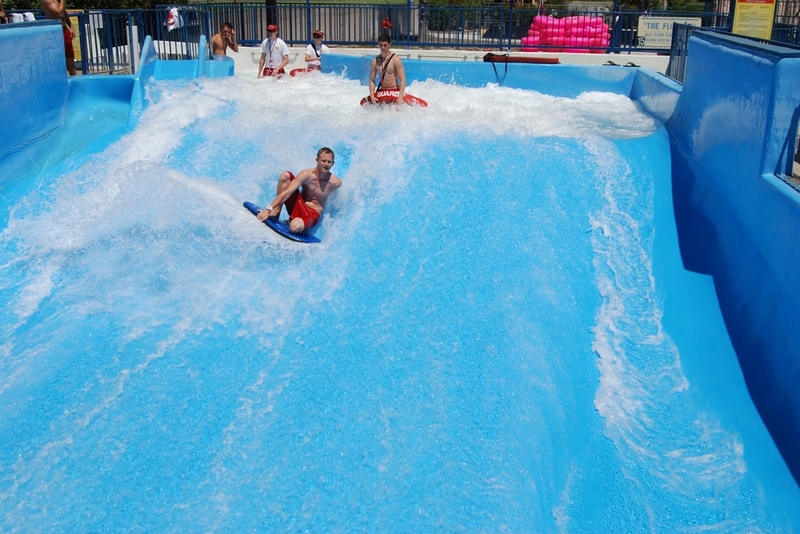 Surfing's hard, we know -- but at Splash Kingdom we have RipTide Surf Pool™ to help you out! Become a surfing pro by riding a boogie board on this endless wave! Surf's up! Minimum Rider Height: 42"
A quarter-mile of sheer relaxation awaits you and the family in The Nile River. Try keeping count of how many times you make it around -- its harder than it sounds! Looking for fun for the younger ones? These pools and structures will have your kids smiling and splashing like never before! Looking for a secluded area for gentler play? Look no further than Fantasy Island! Nestled in the middle of The Nile River, this area is perfect for the lil' ones -- complete with over 5 slides, water spouts, and a water-tipping bucket! For participation on either one of Fantasy Island's grounded waterslides, guests must be no taller than 48". Toddlers absolutely love The Yellow Submarine -- and it's conveniently located in Castaway Cove so parents win, too! Adventure is alive at the Lost Temple Activity Pool! With lily-pads, water spouts, mild slides, and rope courses -- the young adventurer will never want to leave! For participation in any three of the Lost Temple waterslides, guest must be no taller than 48".